We understand the things that are important to you. And our relationship with you and the process for securing your family’s future begins right there. At Bruce Cooper's office, we put not only our own considerable experience to work on your behalf, but we also leverage our strategic resources to bring you the knowledge of professionals experienced in taxes, law, life insurance, accounting, and philanthropic planning. 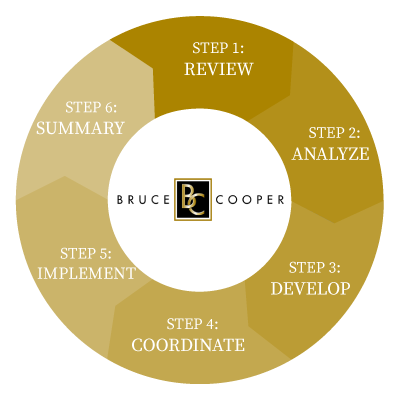 This coordinated approach helps ensure that all areas are considered in order to formulate the right course of action for you. Coordinate your financial activities. We regularly coordinate insurance and financial activities for clients with the other members of their team of financial, tax and legal professionals. We can do the same for you. Strategies are not a one-shot deal. They need to be adjusted periodically as your life and the economy changes. We will work with you over the years to help keep your goals on track with your changing needs. Neither Bruce Cooper, Leslie Moyher nor New York Life Insurance Company, its agents or affiliates provide tax, legal, or accounting advice. Please consult your own tax, legal or accounting professional before making any decisions.